13 pilgrims were kidnapped in the Syrian city of Aleppo today. These pilgrims are all Shiite and were taken by rebels as their bus passed through the city on their way back from Iran. As a result, Hezbollah-supporters are now burning tires and closing the roads. Hassan Nasrallah is now having a speech to calm his people down. It’s obviously working. His level of control is unparalleled. Talks are already underway to release the 13 men. Prediction: they will be out in a few days, max. 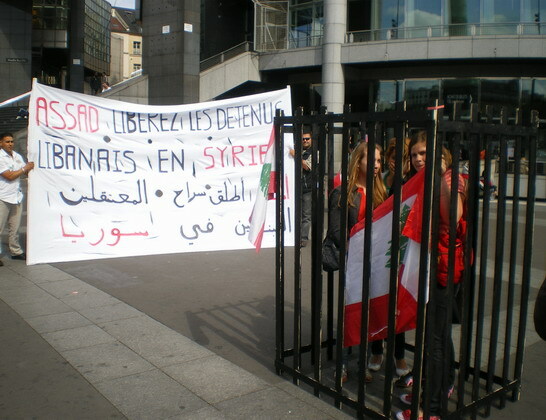 Every other Lebanese prisoner present in Syrian prisons or still missing because of the Syrian occupation of Lebanon. Their parents have been protesting for the past 5 years non-stop, asking for any news about their sons and daughters. They’ve been hearing nothing. The parents of these men and women don’t want their children to return alive anymore; they just want any news about their children for the sake of a thirty-years stretched out closure. Even that is too much to ask for. What’s the “fault” of these men and women? They are Christian or not part of the pro-Syrian assembly of the other sects. It is here that I have to ask: is burning tires, closing roads and threatening civil war the only way to get to something you want in Lebanon? Is turning the country into a more savage jungle the only path towards forcing others to meet your demands? After the past few days, I’m beginning to think so. It is here that I ask Christians in the country: In a country of savagery, is our civility the best option for self-preservation and to make our voices heard? How much more double-facing can the other sects in Lebanon take until they crack as well?